Throughout the eucaryotic cell, especially those responsible for the production of hormones and other secretory products, is a vast amount of membrane called the endoplasmic reticulum, or ER for short. The ER membrane is a continuation of the outer nuclear membrane and its function suggests just how complex and organized the eucayotic cell really is. When viewed by electron microscopy, some areas of the endoplasmic reticulum look "smooth" (smooth ER) and some appear "rough" (rough ER). 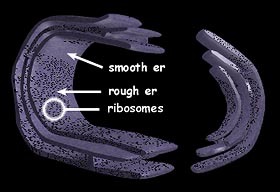 The rough ER appears rough due to the presence of ribosomes on the membrane surface. Smooth and Rough ER also have different functions. Smooth ER is important in the synthesis of lipids and membrane proteins. Rough ER is important in the synthesis of other proteins. Information coded in DNA sequences in the nucleus is transcribed as messenger RNA. Messenger RNA exits the nucleus through small pores to enter the cytoplasm. At the ribosomes on the rough ER, the messenger RNA is translated into proteins. These proteins are then transferred to the Golgi in "transport vesicles" where they are further processed and packaged into lysosomes, peroxisomes, or secretory vesicles.